“The Power Of The Daleks” Coming To Cinemas November 14! A few weeks ago, we ran the news that the BBC had animated a previously “lost” arc of Doctor Who, and it was a pretty crucial one. “The Power of the Daleks” marked Patrick Troughton’s first full adventure as the Second Doctor, and both the BBC and its US counterpart, BBC America, planned to run all six episodes on November 19, the 50th anniversary of the first episode’s original broadcast. But let’s face it — an event like this also requires that Whovians gather and celebrate together. Thanks to BBC America and Fathom Events, we can. And days earlier. BBC AMERICA and Fathom Events announced today a one-night special theatrical screening event of Doctor Who: The Power of the Daleks animated series on Monday, November 14, 2016 at 7:00 p.m. local time – 50 years after the original BBC broadcast – in advance of the premiere on BBC AMERICA on Saturday, November 19, 2016 at 8:25pm ET. The cinema event will also feature exclusive bonus content including interviews with members of the original cast. Tickets for Doctor Who: The Power of the Daleks in cinemas can be purchased online beginning Friday, October 14, 2016 at 10am ET by visiting www.FathomEvents.com, or at participating theater box offices. Fans throughout the U.S. will be able to enjoy the event in select movie theaters through Fathom’s Digital Broadcast Network. For a complete list of theater locations visit the Fathom Events website (theaters and participants are subject to change). The Power of the Daleks is one of the most celebrated Doctor Who adventures, and yet no complete film recordings are known to have survived. The master negatives were destroyed in an archive purge in 1974. This brand new animation, being released 50 years after its only UK broadcast, is based on the program’s original audio recordings, surviving photographs, and film clips. The six-part adventure features the regeneration – or as it was then called “renewal” – of First Doctor, William Hartnell, into Second Doctor, Patrick Troughton, and follows the Time Lord and his companions Polly (Anneke Wills) and Ben (Michael Craze) as they do battle with the Daleks on the planet Vulcan. 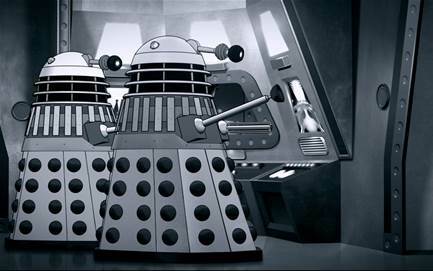 “Ahead of the premiere on BBC AMERICA, it is a rare treat to be able to bring the lost episode, Power of the Daleks, to life using modern animation techniques. Doctor Who cinema events have been incredibly successful, and this is extraordinary opportunity to allow a new generation of fans the opportunity to experience this classic adventure for the first time,” said Soumya Sriraman, EVP, Franchise and Digital Enterprises, BBC Worldwide North America. Doctor Who: The Power of the Daleks is produced and directed by Charles Norton, with character designs from acclaimed comic book artists Martin Geraghty and Adrian Salmon.